Sri Lanka, as a nation can be proud of some of its achievements. For example, we can be happy of our population growth which has come down to a modest 1.1% per year. We also can be satisfied with our health indicators, especially the impressive reductions in maternal and infant mortality in the last few decades and our well-integrated patient care service. But can we be equally happy with our increasing road accidents? Let us take a look at few of the statistics. Our vehicle population has risen from 0.213 million in 1977 to 7.2 million in 2017. All varieties of motor vehicles from tippers to three-wheelers and motor cycles were registered during this period. With this change, very sharp increases were observed in the motorcycles and three-wheeler segments. By the end of 2017, there were 4.0 million motor cycles and 1.1 million three-wheelers plying on our roads. These increases in numbers (without corresponding development of road infrastructure) resulted an uncontrollable trend of road accidents. At the same time, the number of reported fatalities to the Police has increased from 1,454 in 1989 to 3,554 by 2017. According to the WHO data, in 2017 the age adjusted death Rate in Sri Lanka is 16.33 per 100,000 of population. It is obvious road traffic accidents have not only become a major killer causing a national tragedy in our country but also a regular feature. What is more shocking is the fact that, according to the past 20 years’ statistics, most death victims belong to the age group between 20-45 years, the most productive age limit. And also, of the total accident victims killed 57% were pedestrians and passengers. Going through the statistics, one can legitimately ask: Are we treating the life of human being so cheap? The Sri Lanka Police and the National Council for Road Safety have taken several steps to minimize road accidents. They were continuously improving road safety measures and also educating the public regarding traffic rules. More remains to be done. Sri Lanka’s fast and dynamic growth of motorization over the last 40 years will take any outside observer by surprise. But along with this motorization we should have developed a sustainable national programme to ensure road safety which we didn’t. We didn’t consider road traffic accidents a priority issue in our national agenda. This lapse has now escalated into a full-scale national issue with growing motorization turning into a painful experience. Today, we have a road infrastructure not developed for the growing needs. We have a large differentiated fleet of vehicles chaotically competing with each other for the limited road space. With only a few preventive schemes in their hands, the traffic police officers are finding extreme difficulty to implement an effective traffic enforcement. Overall, there is every indication that the years to come the situation can become worse. The countries across the world including Sri Lanka adopted the sustainable development goals of the United Nations in 2015. ‘Ensuring healthy lives and promoting well-being for all at all ages’ is one of the 17 sustainable development goals (Goal 3), under which a target was set to achieve a 50% reduction in the number of global deaths and injuries from road traffic accidents by 2030. As a nation, are we ready to meet this challenge, or at least to march towards the target? The commonly known causes of our road accidents include gross indiscipline on our roads, fatigue driving, drunk driving and over-speeding. Drivers are often blamed for accidents, but according to Prof. Amal Kumarage of Moratuwa University, the assumption is not always correct. He says, “There are several other parameters that are equally important when considering road accidents. He says, “Minimum standards in roads designing, unsafe junctions, bends and pedestrian crossings, visibility at night, and potential black spots, have not been properly dealt with.” He adds that based on research, 60% of serious road traffic accidents are mainly due to badly designed roads. The indiscriminate use of the road by some pedestrian is also another major cause of the road accidents in the country. Fatal accidents caused by private and state-run buses are also high. Traffic Police Headquarters data show that private buses were involved in 138 deaths in 2017 while Sri Lanka Transport Board buses have ended the lives of 36 people. 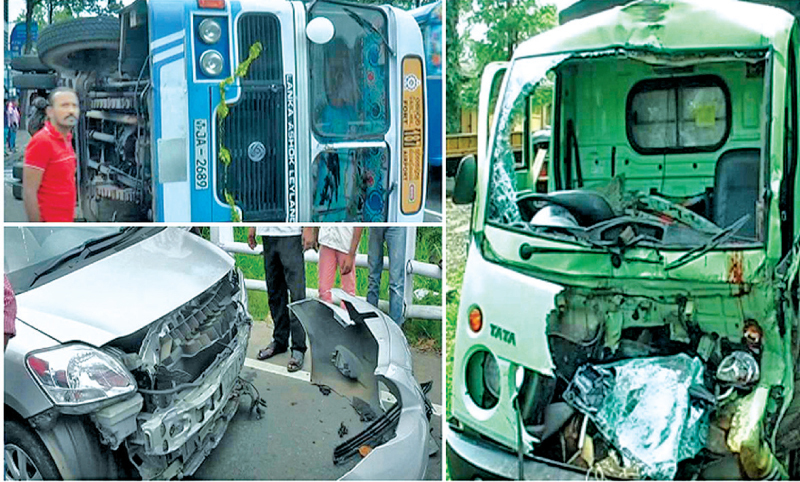 If Sri Lanka plans to reduce the number of road accidents and fatalities by 50% by 2030, there is an urgent need to take drastic measures to save precious human lives. Most important of all, the Government should formulate an updated National Road Safety Policy. This Policy should outline various policy measures such as promoting awareness, establishing road safety information data base, encouraging safer road infrastructure including application of intelligent transport, enforcement of safety laws etc. We have a National Council for Road Safety with a mission of “To create a society free of Road accidents.” It should be converted into the apex body to take policy decisions in matters of road safety. The Ministry must request all Provincial Councils to set up Road Safety Councils and Provincial Road Safety Committees, and to work with National Council for Road Safety. The Ministry must formulate a multi-pronged strategy to address the issue of road safety based on 4 ‘E’s viz. Education, Engineering (both of roads and vehicles), Enforcement and Emergency Care. The Ministry must set up model driving training institutes in provinces and refresher training to drivers of heavy motor vehicle in the unorganised sector. The Ministry should introduce vehicle telematics and install surveillance system on roads to monitor the speed limit of vehicles. Over-speeding vehicles should be fined heavily. This can be done in the public-private partnership (PPP) model by paying from the fines collected. The Ministry should also recommend that the driving licence issuing process to be more stringent but transparent. Certain changes are also needed in the current fine system. Two examples as successfully implemented in some countries as follows: (1) linking annual insurance premium of the vehicle with the driving behaviour. A driver with bad traffic history should pay more insurance premium compared to a safe driver; (2) when a driver commits a traffic offence and is fined, his penalty point is indicated on his revenue license. The points are be predetermined for the different categories of traffic offences. Beyond a certain level of penalty points accumulated, he might lose his license or a specified time. Road traffic accidents may not be 100% preventable, but could be minimized. The isolated or ad-hoc solutions will not help combat the issue. To draft a sustainable solution and make it effective, it is imperative to have a great political will and commitment. On one hand, while the Government intensifies its public education on road safety programmes, on the other hand, the media should support to heighten the awareness creation. There was a time many decades ago when the Traffic Police went to schools and gave live demonstrations of Road Safety. It seems time is now ripe to resume such campaigns in a much broader context covering not only schools, but Government and mercantile establishments. Our religious leaders and social leaders also have major role to play. They should sensitize their followers or supporters as well as members of the public on the menace of road accidents in the country. Owing to the socio-economic impacts that road traffic accidents generate, it deserves to be given political priority and commitment. In developed countries where the personal commitment and interest of their Governments in the maintenance of sanity on the roads has culminated in a drastic decrease in road accidents and adherence to road regulations. The fine system linking annual insurance premium, demerit points and the solutions proposed are all good. However, the quality of drivers is the responsibility of the Driving Instructors,Motor Examiners,Traffic Police with updated traffic regulations.to instill in the driver, the lane concept, driving standards on high speed motorways, right of way at roundabouts, avoid traffic congestion at intersections etc.The driver no matter how urgent a problem he may have should train to keep calm at the wheel and not attempt to get ahead and block on coming traffic.Furthermore, another shortcoming of the Sri Lankan driver is the disrespect to other drivers who signal their intention to cross from one lane to another for the purpose of exit from the highway to a side road. The traffic police need to be vigilant and warn such drivers to respect other road users.